The latest imagery of Cyclone Ului from the Bureau of Meteorology. 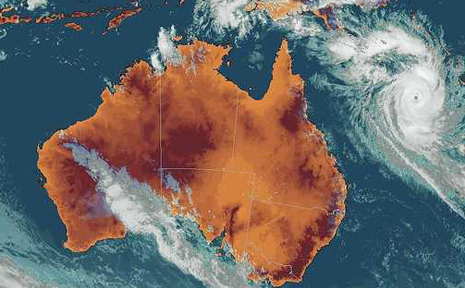 ONE hundred and fifty holidaymakers were evacuated from Heron Island – 90 kilometres due east of Keppel Bay – today as Cyclone Ului tracked slowly but menacingly towards the Queensland Coast. Owners of the Heron Island Resort said they would complete the evacuation tomorrow, when 100 staff will be transported to Gladstone, leaving the reef paradise to the mercy of the vicious weather system. The University of Queensland closed its research station on the island early today and started to move scientists, guests and important equipment and samples by catamaran as 60kmh winds battered the reef. A spokeswoman for Heron Island Resort said: “Given the projected path of the cyclone we made the decision today to take guests to the mainland. It was all done very calmly, but it was better to act while it was possible to leave safely. The luxurious facilities on the island, and the beauty of the surrounding coral cay, have seen it named as one of the world's top seven dive sites which attracts visitors from all over the globe. For in-depth coverage of Cyclone Ului, see tomorrow's Morning Bulletin.